Do We Need a New School of Economics? “Consider the following scenario. You are an airline pilot charged with flying a planeload of passengers across the Atlantic. You are offered the choice of two different aircraft. The first aircraft has been prepared by chief engineer Keynes and the second by chief engineer Hayek. You have to choose which plane to use, so naturally you ask the advice of the two engineers. Keynes urges you to use his aircraft, offering a convincing explanation of why Hayek’s plane will crash on take-off. Hayek urges you to use his aircraft, offering an equally convincing explanation of why Keynes’s plane will crash on landing. Thus begins a fascinating new book, “Money, Blood and Revolution: How Darwin and the doctor of King Charles I could turn economics into a true science,” by the fund manager and economist, George Cooper. 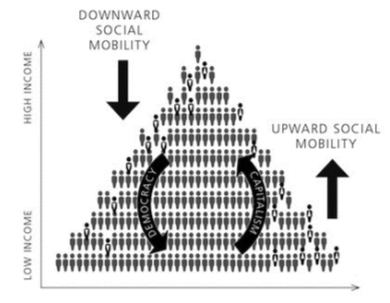 Mr. Cooper sets up a circulatory model of democratic capitalism whereby rent, interest payments and profits flow from low income people at the bottom of the pyramid to the wealthy at the top. And then tax revenue (collected mostly from the wealthy) is redistributed downward in the form of government programs. Stop adding to the problem. High student debt and high mortgage debt are still being supported by government programs. Change the course of the monetary river. Quantitative easing does not work because it just puts money into the hands of the wealthy and they have no incentive to spend it. Change the course of the fiscal river. Instead put money into the hands of the people at the bottom of the pyramid with expanded government spending on infrastructure (paid for by taxing the wealthy). Without endorsing all of Mr. Cooper’s suggestions, he nevertheless has many good ones and expresses them in a highly entertaining style! This entry was posted in "tax the rich", Blood and Revolution", economic growth, economic inequality, economic mobility, economic opportunity, Economy, economy, fiscal policy, financial crisis, George Cooper, student loans, tax policy, the floudering of America, Uncategorized, wealth inequality, wealth tax and tagged economic growth, Economic inequality, economy, financial crisis, Fiscal policy, George Cooper, jack heidel, monetary policy, student loans, tax reform by jackheidel. Bookmark the permalink.